In this page area around circle we are going to see some example problems with clear steps.We already know that how to find the area of the circle. In the same thing, we are going to see a different concept here. In these problems we will have two circles. To find the area around the circle we have to subtract the area of the smaller circle from the area of the larger circle. 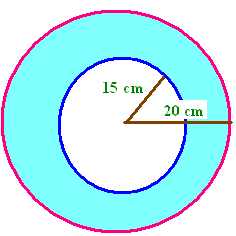 Find the area of a ring whose outer radius is 20 cm and inner radius is 15 cm respectively. There is an outside circular path had constructed around a circular garden. If the outer and inner circumferences of the path are 88 cm and 44 cm respectively. Find the width and area of the path.